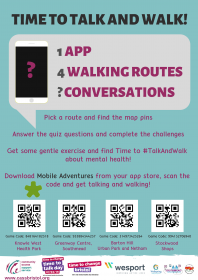 This Time to Talk Day we’ll be encouraging everyone to make Time to Talk about mental health, and to help Bristol residents start conversations we’re launching a #TalkAndWalk app! Talking about ‘mental health’ can be difficult, however, we all know how it feels to be tired, stressed or experiencing low moods. You don’t have to have a mental illness to experience mental ill-health but there is still a huge amount of stigma attached to the subject. We aim to break this stigma down through conversations and activities. Starting on February 4th, head to your app store and download Mobile Adventures. Then head to one of our four locations across the city and scan the QR code for each route. You’ll be able to register your team (or just yourself!) and see the locations of the pins on the map. Walk towards the pin and when you reach it, answer the question or complete the challenge that pops up! If you don’t have a smartphone or you don’t live near one of the routes, you can still join in by downloading a paper copy of the quiz that can be used anywhere, or heading to Wellspring Healthy Living Centre, Knowle West Health Park or Greenway Centre to pick one up. Any elected leader’s most important relationship is with local people, and Police and Crime Commissioner Sue Mountstevens is entrusted to deal with people’s lives and personal circumstances. The post of Contacts and Conduct Policy Officer is at the frontline of this hugely rewarding work. We’re looking for an enthusiastic and self-motivated individual to deliver help and support to individuals and communities, dealing with all public contacts and providing a proactive and responsive service to complaints and to help bring improvements in policing. Casework is one of the most important roles Sue Mountstevens can play for local people and you can go home knowing you’ve made a real difference. The role offers an opportunity to be involved in public service and improve outcomes for local communities. We’re looking for someone with a background in customer service, complaints, quality of service and policy work, who is able to work in a high profile and fast paced environment. The CASS Network Event is coming soon – book your free ticket via Eventbrite before they’re all gone! 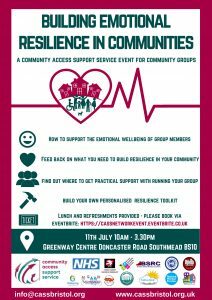 Community Access Support Service invites members of community, equalities and faith groups to join us to explore the practicalities of building emotional resilience within Bristol’s diverse communities. Over the last few years community groups and local services have faced cuts and increased demand, while individuals are facing daily social and economic pressures. Research shows a strong link between inequalities and poor mental health outcomes, and city decision makers are keen to address this by strengthening community resilience. The day will be full of talks, networking opportunities and interactive sessions to allow you to contribute. All participants will receive a Toolkit Template and will be able to tailor it to their own needs by picking up information and resources throughout the day, and will receive resources from organisations speaking at the event and holding stalls. Vegetarian lunch and refreshments will be provided. For more information, please see Eventbrite. CASS have a vacancy for a Networker for Inner and East Bristol, based at the Wellspring Healthy Living Centre for 32 hours per week. For more information and to apply for the role, please click here. The closing date for applications is Monday 11 June 2018 12 noon, and interviews will be held on 28 June 2018 (afternoon). Steer The Strategy Event – A Great Success! Thank you to everyone who attended the CASS and Partners Networking Steer the Strategy Event on Thursday 13th. The thoughts and ideas that were bouncing around the room were very exciting to hear, and it was great to find out more about the THRIVE mental health and wellbeing approach. If you would like to have another look at the presentations and information about THRIVE, or you weren’t able to attend and would like to look at them for the first time, links for these are below. Can’t attend the Steer the Strategy event but would like to have your voice heard? Don’t worry, we are also taking people’s thoughts electronically, as well as in person at the event itself. Have a look at the two questions below – these are going to be key questions on the day. If you’d like to submit your ideas, please email your responses to info@cassbristol.org. What are the challenges in your community around mental health and emotional wellbeing? What would you like to see to make a mentally healthy city? Your answers to these two questions will be added to the notes taken at the event.